[Guest post by Rooi Ping Lim in Sydney, Australia] USK Sydney kicked off the 2018 New Year on a glorious summer day at Watson Bay, an iconic beach on the eastern suburb of Sydney. 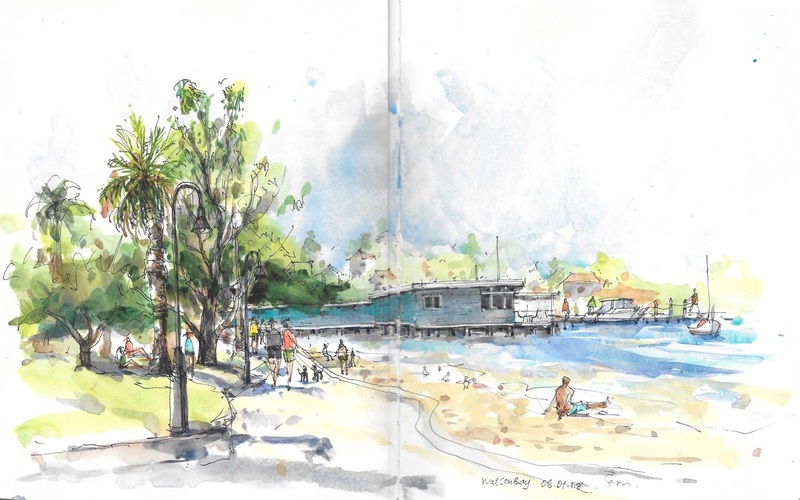 Watson Bay has lovely beaches, delicious seafood, views to awe anyone and abundant ‘sketchable’ spots for sketching-mad sketchers! A large group of sketchers embarked from Circular Quay on board the famous green and gold ferries and enjoyed the amazing harbour view along the way. It was like a great reunion - a few visitors from near (other states), as far as England and also new acquaintances. Drawing beach scenes posed many challenges for me. For my first attempt (above) I was, as usual, too greedy. I wanted to squeeze everything onto one page, however it resulted over a two-page spread. Meanwhile, there was a lot of chatting, swapping stories of the holiday period and catching up with friends. My focus was a bit divided. My next subject was Doyles on the Beach Restaurant - Australia's first seafood restaurant. I looked out while sitting on Doyles on the Wharf Takeaway & Bistro along the jetty. The Doyles family has a long association with Watson Bay, where they have owned and operated the restaurant for over five generations. Doyles on the Beach has been on its original site since 1885. I was attracted to the green and cream wooden building and façade set among the background of lush green vegetation, blue skies and turquoise sea. 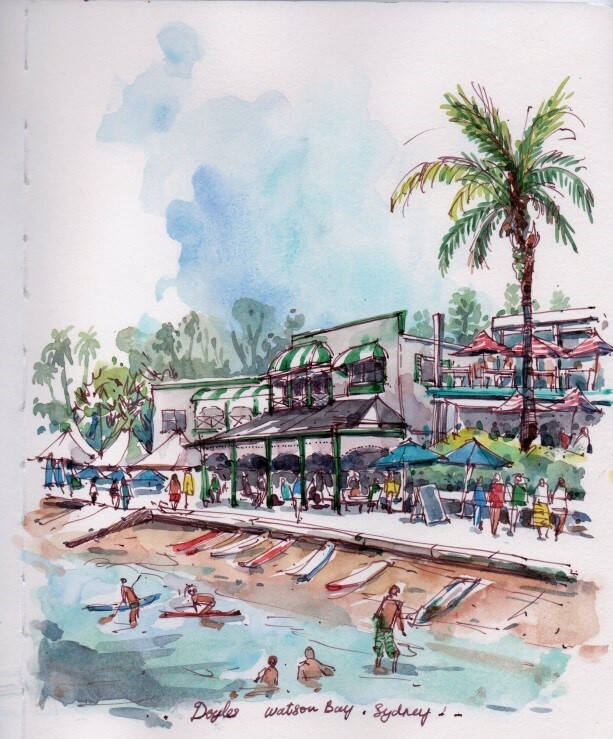 There was so much happening around me, happy people swimming and splashing in the water, groups of paddleboard lessons and a long queue of patrons waiting outside Doyles. 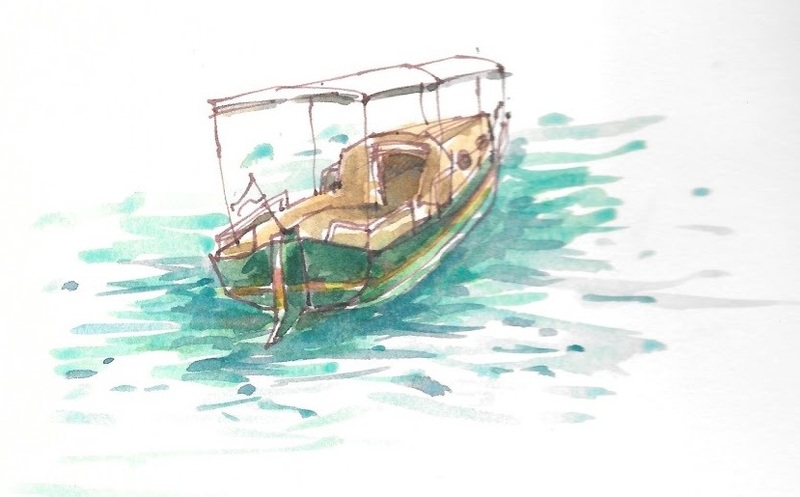 A little emerald green boat moored not far from where I sat reminded me of those old James Bond movies. After lunch (a fish burger and ice cold beer), I returned to the same spot and tried to capture the increased boating activities towards the city skyline. 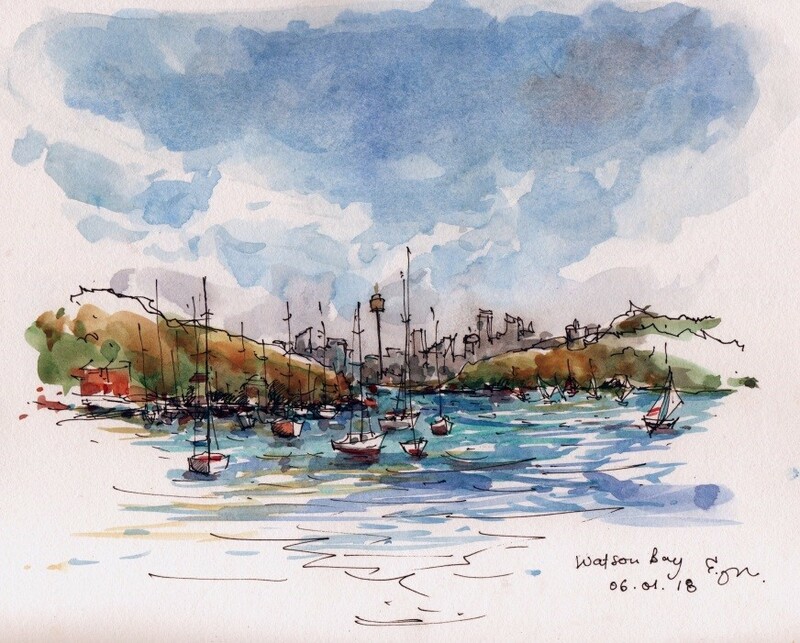 You could see the Sydney Tower in the middle of this sketch with the clouds starting to gather at the horizon. On my drive home along the hilly, winding Old South Head Road, I turned a bend and suddenly a magnificent lighthouse appeared before me. 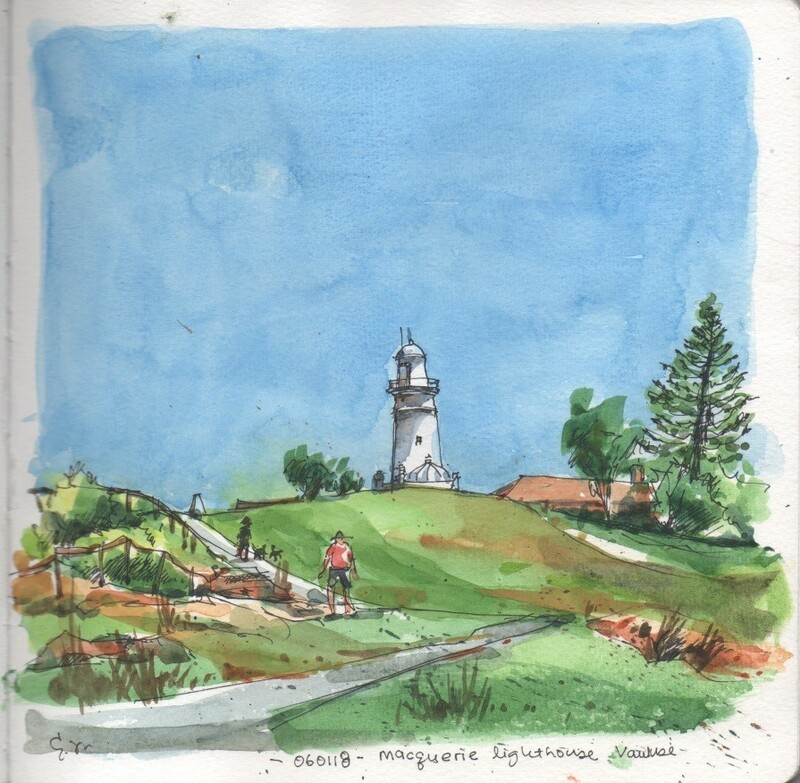 The Macquarie Lightstation is Australia’s oldest lighthouse (1818) and it is still operating today. Of course, I had to stop, gather my gear and run to search for a spot to sketch. There was no shaded shelter anywhere. Mind you, it was past high noon, so there was constant cool sea breeze. I said to myself, “you can do this, no shade no problem, be quick, simple and accurate”. I lasted 17 minutes before I felt I was baked! I thought the combination of clear blue skies, bright white lighthouse on lush green was definitely worth it. As a bonus, I ended up with a nice tan! Rooi Ping Lim is based in Sydney, Australia. 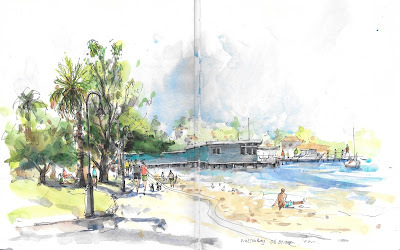 She is a member of Urban Sketchers Sydney. You can see more of her sketches on Instagram.